Conducted by Edward Gardner, the hr-Sinfonieorchester (Frankfurt Radio Symphony Orchestra) plays Sergei Rachmaninoff’s Isle of the Dead, Op. 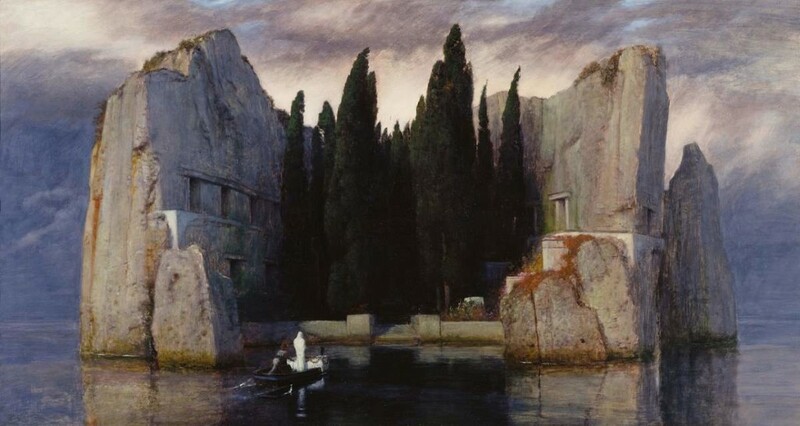 29, a symphonic poem inspired by Arnold Böcklin’s painting, Isle of the Dead, which the composer saw in a black-and-white reproduction in Paris in 1907. Recorded live at Alte Oper Frankfurt on September 25, 2015. 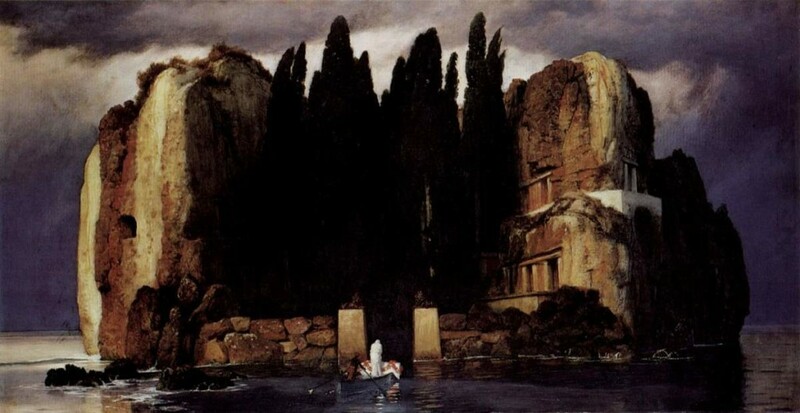 Isle of the Dead (German: Die Toteninsel) is the best-known painting of Swiss Symbolist artist Arnold Böcklin (1827–1901). Böcklin produced several different versions of the mysterious painting between 1880 and 1886. All versions of Isle of the Dead depict a desolate and rocky islet seen across an expanse of dark water. A small rowboat is just arriving at a water gate and seawall on shore. An oarsman maneuvers the boat from the stern. In the bow, facing the gate, is a standing figure clad entirely in white. Just behind the figure is a white, festooned object commonly interpreted as a coffin. The tiny islet is dominated by a dense grove of tall, dark cypress trees—associated by long-standing tradition with cemeteries and mourning—which is closely hemmed in by precipitous cliffs. Furthering the funerary theme are what appear to be sepulchral portals and windows penetrating the rock faces. 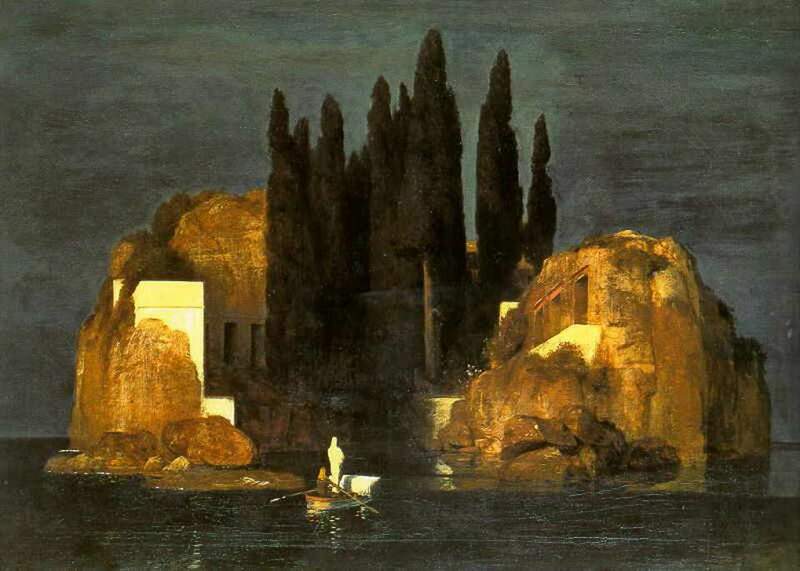 After seeing the black and white reproduction, Rachmaninoff was so haunted by this mysterious image, with its solitary island-bound boat bearing a coffin, that he began to write music almost at once, without even waiting to see the full-color original. 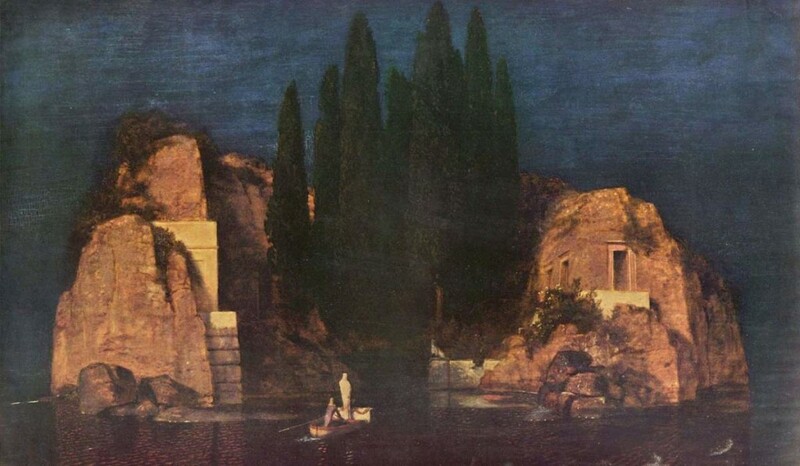 When he later traveled to Leipzig to view one of the five different versions Böcklin painted of The Isle of the Dead, he said nothing could match his first impression—he even suggested that he might never have composed The Isle of the Dead had he seen the painting first. 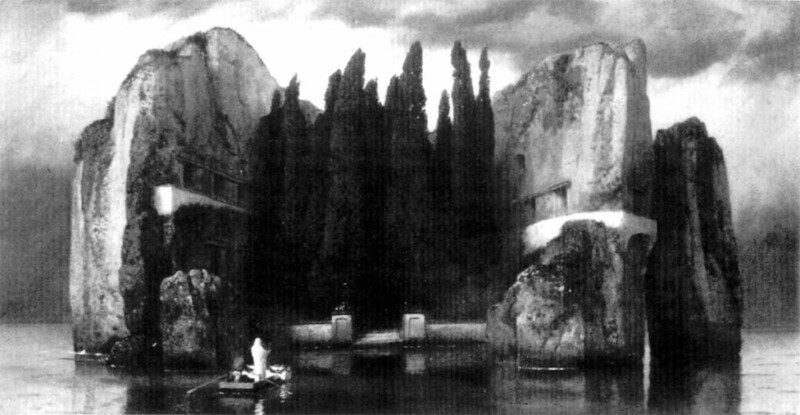 Arnold Böcklin, The Isle of the Dead (Die Toteninsel) – The fourth version (black-and-white photograph). Year: 1884. Rachmaninov begins with the irregular movement of oars in the water, suggesting the sound of the oars of Charon(1) as they meet the waters of the river Styx(2), while the lowest range of the orchestra tolling ominously, like a slow funeral march, reminiscent of the opening of the Second Piano Concerto. The opening is dark: just low strings, with timpani and harp at first—and mysterious. As the strings rise to the surface, the gently lapping 5/8 rhythm (the waves, the rocking boat) breathes with determination, as relentless as Holst’s Mars, as dark as Sibelius’ Tapiola. In effect a long crescendo, the boat approaches the Isle, passing through the mists that separate earthly life and the realm of the dead. Then comes the yearning desire for the rest that death grants, a section of sweet melodic outpourings. After the climax of violent pounding chords, the strings begin (15’56”) to eerily chant the Dies Irae (“Day of Wrath” from the Latin Mass) motif, made all the more creepy by scoring it tremolo. Suddenly – bliss in the form of woodwind, resignation of a wind chorale. His task completed, the grim boatman of death begins his departure. The undulating waves return, slowly, ever so slowly, sending us away from the Isle. The music fades, ends. Böcklin himself provided no public explanation as to the meaning of the painting, though he did describe it as “a dream picture: it must produce such a stillness that one would be awed by a knock on the door.” The title, which was conferred upon it by the art dealer Fritz Gurlitt in 1883, was not specified by Böcklin, though it does derive from a phrase in an 1880 letter he sent to the painting’s original commissioner. Not knowing the history of the early versions of the painting (see below), many observers have interpreted the oarsman as representing the boatman Charon who conducted souls to the underworld in Greek mythology. The water would then be either the River Styx or the River Acheron and his white-clad passenger a recently deceased soul transiting to the afterlife. In Greek mythology, Charon or Kharon is the ferryman of Hades who carries souls of the newly deceased across the rivers Styx and Acheron that divided the world of the living from the world of the dead. A coin to pay Charon for passage, usually an obolus or danake, was sometimes placed in or on the mouth of a dead person. Some authors say that those who could not pay the fee, or those whose bodies were left unburied, had to wander the shores for one hundred years. In the catabasis mytheme, heroes – such as Heracles, Orpheus, Aeneas, Theseus, Sisyphus, Dionysus, Odysseus and Psyche – journey to the underworld and return, still alive, conveyed by the boat of Charon. In Greek mythology, Styx is a deity and a river that formed the boundary between Earth and the Underworld (the domain often called Hades, which also is the name of its ruler). The rivers Styx, Phlegethon, Acheron, Lethe, and Cocytus all converge at the center of the underworld on a great marsh, which sometimes, also is called the Styx. According to Herodotus the river Styx originates near Feneos. Styx also is a goddess with prehistoric roots in Greek mythology as a daughter of Tethys, after whom the river is named and because of whom it had miraculous powers.